Who’s Afraid of Virginia Woolf? Is Edward Albee’s most acclaimed play, debuting in 1962, a time many consider to be a period of relative innocence before subsequent turmoils. The play is both a product of it’s time and a fascinating multilayered piece touching on subjects far beyond the seemingly inconsequential quarrels of a bickering couple. The inclusion of a timeline of world and particularly significant American events in the programme is a useful reference point for those unfamiliar with the social history of the time and as such the underlying themes of the piece. David Thacker is of course an established authority in the direction of the great American plays. Having opened his Octagon tenure with All My Sons in 2009 and following this up with Tennessee Williams’ A Streetcar Named Desire in 2010 and Miller’s The Price later in the 2010-2011 season he again returns to the genre with Who’s Afraid of Virginia Woolf? While the title was inspired by a simple line of pedagogic graffiti adorning the mirror of a bar visited by the author, as with other Albee works criticism of the damage, both morally and spiritually inflicted by an excess of material wealth and an obsessive misguided pursuit of the American Dream is at the heart of the piece. Albee’s works are often viewed as being searingly critical of traditionally held values and in keeping with his custom Who’s Afraid of Virginia Woolf? is another affirmation of his deep seated unease with the absurdity of the human condition. As with many recent Octagon productions this one is played in the round, an acknowledged preference of the director. The set, like All My Sons, Ghosts and The Price, is the creation of Patrick Connellan and is an authentic academic based residence replete with an entire collection of eclectic ephemera strewn liberally. This creates an intimate arena into which the audience are inexorably and voyeuristically drawn. The tone for this challenging piece is set as soon as Martha and George appear in Act 1 and the verbal sparring begins. Far from being a dour piece Albee’s perceptive dialogue crackles with long held tensions hiding deep felt wounds. These tensions reach breaking point as the cynical sniping of the main characters continues but the production draws humour from every quarter in the first two acts. The savagely sarcastic vitriol continues flowing as freely as the liquor despite the arrival of their guests, a couple positively oozing the hope and expectation of youth. Through a series of increasingly cruel games, under the increasingly embarrassed gaze of their young guests, illusions are destroyed and the façade of each character is mercilessly stripped away. The cast work extremely well together, dovetailing the demanding and rapid dialogue in the most immersive way. Even in Acts 1 and 2 where seemingly Martha has the upper hand in their games, George Irving’s George is not simply an emasculated foil for Martha’s fury; rather he displays a sparkling wit and controls much of the action. Instead of feeling the intended humiliation from Martha’s attacks he seems to thrive on it and meets each assault with a suitable scholarly retort. Martha’s soliloquist opening to Act 3 augurs a change in pace of the production. This introspective scene is played with a perfect poignant vulnerability by Margot Leicester who shines with a quiet intensity throughout the entire play. Kieran Hill is a veteran of numerous memorable Octagon performances over the last two years, A Midsummer Night’s Dream, The Comedians, The Hired Man, Love on the Dole and A Streetcar Named Desire to name but a few. He proves again here his versatility and superb acting skills. As with Lydia in All My Sons, in 2009, Tammy Joelle is perfectly cast as Honey, the young wife of new Biology professor Nick. She manages to convey the perfect mix of naivety and unspoken pain as the younger couple are drawn in to the dangerous games of the older duo. She manages to make Honey annoyingly simpering yet somehow endearing. A completely enthralling performance. Since this production uses Albee’s 2004 re-write of the text the audience is denied the opportunity to fully appreciate the extent of the transformation Honey undergoes during this torrid night and reduces the impact of her declaring her desire to have a child in Act 3. The cuts were explained by Albee in subsequent interviews as being no more than he felt he had overwritten those parts originally. Unfortunately, they remove whole swathes of Honey’s character and while this arguably creates a stronger ending to Act 2 it means the audience miss the opportunity to see the final revenge from forming in George’s mind. It also means the loss of the final moments from the original end of Act 2 where his almost whispered preparatory speech mirror Martha’s susurrous opening of Act 3. 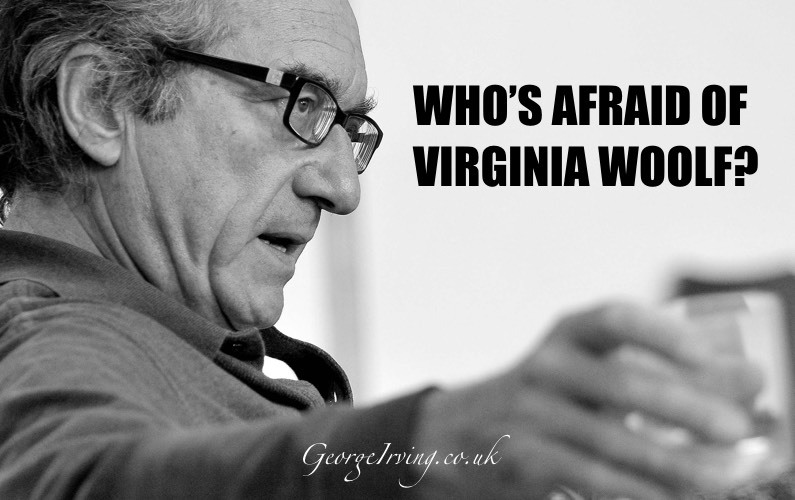 In Who’s Afraid of Virginia Woolf? Albee innovated a blending of realism and absurdism creating an enduring work. The updated profanity probably still doesn’t have the capacity to engender the same level of controversy that accompanied the original release but time has done nothing to dull the acerbic wit and power of the piece. This wonderful production is another triumph from the Octagon.